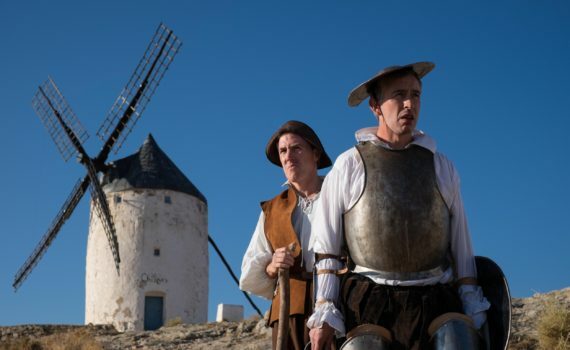 Coogan & Brydon team up yet again for a trip around the world, this time to Spain. It started as a short-run TV series, it became a film (The Trip), then a sequel (The Trip to Italy), then a trilogy (The Trip to Spain), and I have no idea when this wonderfully entertaining vacation might end, but I kind of hope it never does. These pals are hilarious given the freedom to improvise, to poke fun, to do impressions, to let off steam, and these films capture organic comedy in a way few have before. I really enjoyed the first two, and I was certain to enjoy the third, basically because the same formula is brought to our screens again, and more of the same deliciousness is rarely a bad thing. Steve is back on the road, following his Philomena success, preparing to write a book mirroring one of his favorite novels, depicting his own travels as a young man, inspired by Don Quixote, going wherever the wind may blow him. Along for the ride, faithful friend Rob, who will write a few more restaurant reviews as they trek across Spain; gotta make a living somehow. And the two friends will doubtless drive each other insane with their constant Roger Moore and Marlon Brando impersonations, making us laugh in the process. It’s two British comedians on the road, eating good food, mocking life, and at the same time enjoying every moment of it. If you’ve seen the first two, you know what to expect from this new installment. It’s improv, it’s dry, it’s English, it’s obscure, but it’s a good time had by all, at least if you like your comedy with a spot of tea. I adore the other films, and I enjoyed this one as well, if not exactly as much. Steve & Rob are getting older and they’re looking back on their lives, so there’s a certain nostalgic sadness to this film, even while they crack each other up. The bits are getting a little tired perhaps, we’ve heard all these impressions before, but that doesn’t mean that they’re completely boring. There is a lot to appreciate here, a calm air throughout, an ease of storytelling, a brightness of comedy. The end is a little weird, these guys will definitely be back, I just wonder how long they can keep it up.